Top Fifth Grade Math Games Help To Get Kids Interested In Math! Making math more user-friendly, and even exciting for kids is what fifth grade math games are all about. In this game, kids get to play around with some really cool Magic Squares! Magic Squares are pretty amazing! See how all of the rows add up to the same number, 12. For example the first row: 7 + 0 = 5 = 12. And take a look at the columns - they add up to 12 too! And that's not all folks. Take a guess at what the two diagonals add up to - That's right, 12! Even though this game is on a fifth grade math games page, students from 3rd grade and higher will enjoy. Materials: Deck of playing cards and two extra joker cards (4 all together), copy of magic square grid we provide. 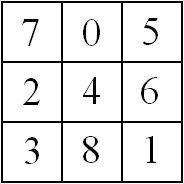 Preparation: Print out copy of magic square grid. Decide which magic square number the game will focus on. For example, if you choose the magic number of 12, select 4 cards from each of the following: joker, 1, 2, 3, 4, 5, 6, 7, 8. Shuffle cards and place face down. Print one Magic Square Game Mat we provide and place on the table within easy reach of each player. Decide who goes first. First player selects a card from the top of the deck and places it on the game mat in one of the nine positions. The next player proceeds in the same way. If player draws a card that is already on the game mat, they put card face up in discard pile and turn ends. If a player wants to change position of one or more cards, they can do so and do not draw a card for that turn. Play continues in this way until a player puts down the second to last card on the mat. At this point there is only one empty spot remaining. The player that places this second to last card says aloud,"Magic Square Round". At the start of the Magic Square Round, all of the cards in the discard pile are picked up and shuffled by the player who put down the second to last card. That player then deals out one card to each player. The player after the dealer places their card down if possible. if they can place their card down, the other players will then have a chance to Block. There are two ways to block a player from putting the last card down and winning. If no player can match the last card placed on the mat, the other players will attempt to Block by first rolling the dice one player at a time. If the number of the last card comes up on the dice, then the Block was successful. The player who laid down the last card will have to pick it up and put in in the discard pile. Using fifth grade math games like this are not only fun for kids, but are a great way to help students with the fundamental math facts they should know in order to succeed in higher level mathematics.